I’ve been wondering what other fun things I can do with rice paper, since I still have some left over from when I made Fried Cheeseburger Spring Rolls. For me, this was a hit. 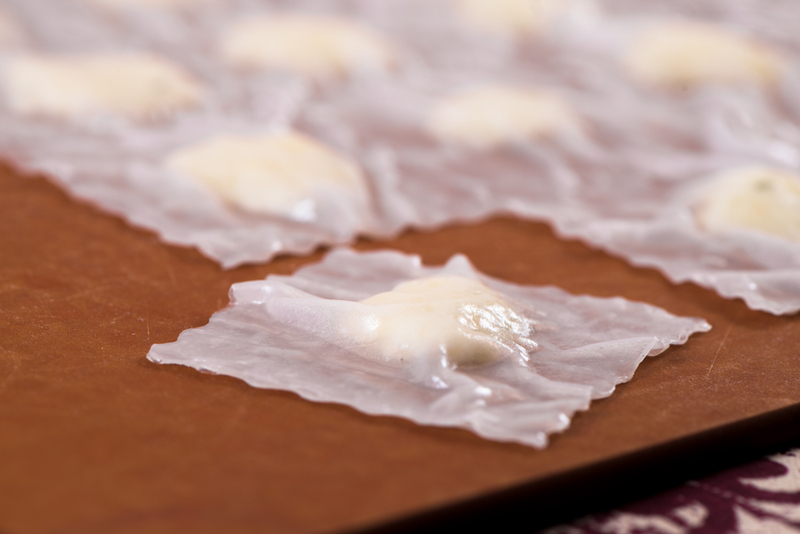 Rice paper can be a little difficult to work with, but if you don’t care what the final product turns out looking like then it’s not such a big deal. Don’t expect these to taste like the ravioli you once knew because the texture of the rice paper is not the same as wheat dough, but they’re still quite good! Especially with the white sauce I used. The filling for this recipe is from Taste of Home, and the white sauce is from All Recipes. It makes a lot of raviolis, probably enough to feed 10 people, so chop it down if you need to! Add water to the large pot about halfway up and set it on the stove on high. When it starts boiling, turn it down a bit so it doesn’t boil over. Meanwhile, in a large bowl, mix together the ricotta, mozzarella, Parmesan, egg, basil, parsley, oregano, salt, and pepper. I used my hand; it was cold but effective. Fill the baking pan with warm water. Dip in a piece of the rice paper and take it out right away. Lay it on the cutting board. Drop about 1/2 teaspoon-size balls of the cheese mixture onto the rice paper, spacing evenly. You should be able to get 16 raviolis on each rice paper. Take two more pieces of rice papers and dip them in the water. Leave them in for about 30 seconds, then lay them on top of the cheese balls. Press down firmly to flatten the cheese, then press down around the cheese until the rice paper starts to stick together (you may need to wet your fingers if it gets too sticky). Cut in straight lines around the cheese using your ravioli slicer (or pizza cutter) in a grid-like pattern. Put the cooling rack on top of the pot of boiling water. Set the raviolis on the rack to steam for about 3 minutes. Remove raviolis and store on a plate. Repeat from the beginning until you have as many as you want. When you’re all done with making the ravioli, you can start the sauce. In your sauce pan, combine the butter and milk. When the butter is melted, add in the flour and stir until thickened, about 8 minutes. If the rice paper has gotten a bit stiff from sitting out, it will soften again once the sauce is added. This entry was posted in Recipes and tagged cheese, fructose malabsorption, pasta, ravioli by nosugarlessgum. Bookmark the permalink.